Dimensions: 13 1/4 x 12 in. Note: Monogram is located in the lower left corner. This painting marks DGR's shift from his exploration of watercolour in the 1850s back to oil as his primary medium. It is also a pivotal work because it displays his turn from what Hunt called his “austerities” to more worldly and even voluptuous subjects that employ highly decorative methods. When Hunt in 1860 saw this picture he judged that DGR had “completely changed his philosophy”, which he showed in his art, “leaving monastic sentiment for Epicureanism” (see Hunt, Pre-Raphaelitism, vol. 2, 111-112). The influence of Titian and of Venetian art in general is clear. Alan Bowness's characterization of the picture is succinct and exact: “Here is something quite new for Rossetti—a voluptuous, inscrutable image, coarse and sensual perhaps, but experienced in precisely the way that differs so essentially from the early work. And Venetian Cinquecento painting now provides Rossetti with a model that replaces his earlier preference for Florentine and Sienese Quattrocento” ( The Pre-Raphaelites, Tate 1984, 25). DGR himself comments usefully on the importance of the picture in a letter to William Bell Scott on November 13, 1859: “I have painted a little half-figure in oil lately which I should like you to see, as I have made an effort to avoid what I know to be a besetting fault of mine—& indeed rather common to PR painting—that of stipple in the flesh. I have succeeded in quite keeping it at a distance this time, and am very desirous of painting . . . various figures of this kind, chiefly as a rapid study of flesh painting.” (see Fredeman, Correspondence, 59. 43). Although this is the first version of the picture that DGR began (on a commission from George Boyce), it was finished second, after he had completed the earlier effort, also oil on panel. Boyce noted in his Diaries (on July 23, 1859) that “D. 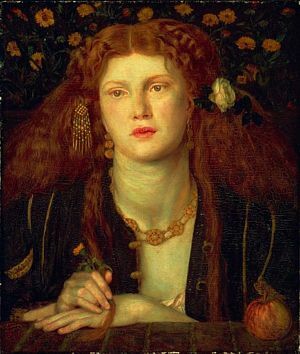 G. Rossetti persuaded me into giving him a £40 commission for an oil portrait of Fanny”. In the entry for October 13 he added: “He has painted a splendid portrait of Fanny for me . . . in late 16th century costume. He has devoted the last month to the painting of it” (see Surtees, Diaries of George Price Boyce). DGR (or perhaps Fairfax Murray) went on to complete the other version of this important work. This other version is now in a private collection in California. Neither of these pictures is the same as the enlarged replica that DGR painted in 1868 (and repainted in 1877 from a different sitter) for George Bowman. The principal flower motif is the marigold, which in the language of flowers signifies pain or chagrin. The apple on the balustrade perhaps alludes to the biblical legend of the fall of Adam and Eve; the white rose in her hair signifies innocence. DGR's turn to Venetian models, and in particular to Titian, is signalled at a technical level in his use of red for this picture's underpainting. His earlier oils had used a wet white ground. The inscription (in DGR's hand on a slip of paper on the back of the picture) is the last sentence in Boccaccio's Decameron, Day 2, Story 7. It translates: “The kissed mouth does not lose its freshness, but renews itself like the moon”. Bullen, The Pre-Raphaelite Body, 51-53, 89-95, 102-108. 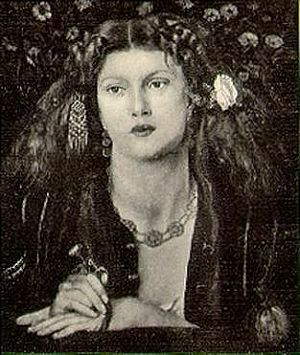 Faxon, Dante Gabriel Rossetti, 150-51. 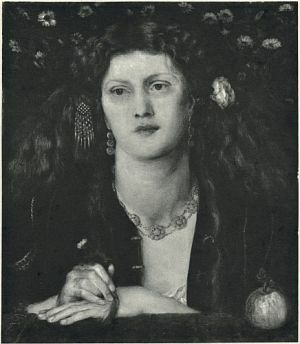 Gowans and Gray, Masterpieces of Rossetti , 13. Marillier, DGR: An Illustrated Memorial , 102. Sharp, DGR: A Record and a Study, 183-86. Stephens, Dante Gabriel Rossetti , 54. Surtees, A Catalogue Raisonné , vol. 1, 68-69 (no. 114). Surtees, A Catalogue Raisonné , vol. 2, plate 186. Surtees, Diaries of George Price Boyce, 27. WMR, DGR as Designer and Writer , 36-38. The Age of Rossetti, Burne-Jones, and Watts, Tate 1997, 96-97. Copyright: ©2000 Museum of Fine Arts, Boston. All Rights Reserved. Gift of James Lawrence. Courtesy, Museum of Fine Arts, Boston. Reproduced with permission. Bocca baciata non perda ventura, anzi rinnova come fa la luna. Note: This inscription (from Boccaccio) is written on the back of the picture. Gowans and Gray, Masterpieces of Rossetti , plate 186.